PLANET in PERIL, your "one-stop shop" for the truth about our planetary crisis. : U.N. Pushes Climate-Smart Agriculture – But Are the Farmers Willing to Change? Is this climate-smart agriculture? Farmin' North American style! KARNAL, India, Sep 17 2014 (IPS) - United Nations Secretary-General Ban Ki-moon is expected to make a strong pitch to world political leaders at the U.N. Climate Summit in New York on Sep. 23 to accept new emissions targets and their timelines. Story here. Surely you jest, U.N/IPS! I truly hope you are not suggesting the kind of farmers depicted in the story's photo (smallholders and landless peasants) need to "adapt" to "climate-smart" ways! What should they be doiing? Using 500 hp tractors and other, massive, fuel-guzzling machinery? Give your head a shake! 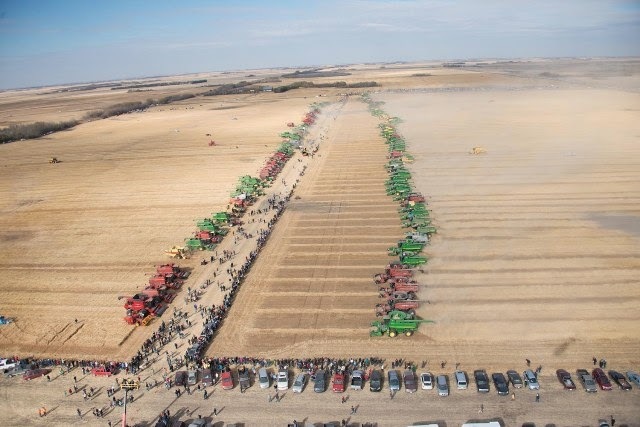 To not even reference the role of western, industrialized agriculture is to make a travesty of the whole process!